I wasn’t kidding last week when I revealed needing to halve my tech article. Modern’s been a brewer’s paradise ever since the Jace and Bloodbraid unbans, and the last couple weeks of 5-0s have proven especially fruitful. This past week adds another smattering of interesting candidates to the fray. First, let’s address Jund, which has indeed reached relative build stability since Bloodbraid Elf‘s arrival into Modern. Apparently, though, it’s also ripe for tinkering. Some recent lists from the Mothership demonstrate surprising innovation for Modern’s most storied midrange deck. We’ve seen Bloodbraid Elf shine in a few decks with mana ramp so far, from Ponza to RG Eldrazi to Valakut. It turns out casting the 3/2 haste a turn early is quite good in Modern (really, casting anything early is good in Modern). Jund also had a mana-dork featuring phase, while Deathrite Shaman was legal, and dominated the format with turn-two Lilianas. ALTNICCOLO wanted to live that dream again, and so took a page out of Abzan’s book with a set of Noble Hierarchs. Early Lilianas still tax the manabase heavily, since Hierarch doesn’t tap for black. Hence the full set of Blooming Marshes and a Twilight Mire in place of other lands, including the third and fourth basics. This build also stays away from red as much as possible, only dipping into the color for Elf itself and a pair of Kolaghan’s Commands. I can see Noble Jund being better against decks that force BGx to act proactively, such as Tron; still, relying on mana dorks makes the strategy less consistent overall. Nobles in Jund might grow into a respectable trend, though—LXCLXC 5-0’d with an identical list just a few days before. Why accelerate into Bloodbraid Elf when you could… not run the card at all? Pining for more control over his “cascades,” OCELOT823 registered a Jund list that was fully legal before Elf’s unbanning, relying instead of Goblin Dark-Dwellers to pull ahead in the mid-game. This deck leans more control than most Jund builds I’ve seen, boasting only 11 creatures and packing a whopping four basics. 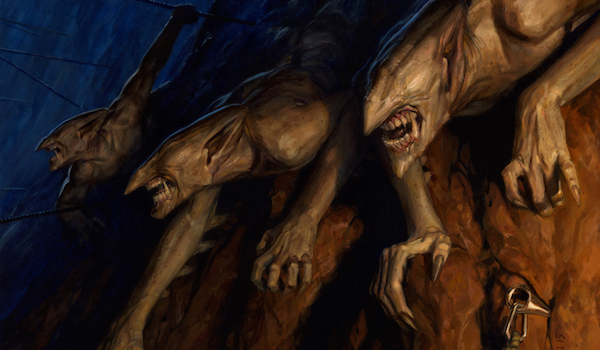 Kolghan’s-Dwellers gives it a bigger Grixis-style value engine at the cost of proactivity—in other words, OCELOT823 isn’t looking to shore up Jund’s bad matchups so much as nail-in-th-coffin its good ones. While this is the first Jund list I’ve seen without Elves (although straight BG Rock decks seem to be doing well in this metagame), the archetype is sometimes trimming its numbers. Even the more stock Jund lists are sometimes dropping to as low as 2 Bloodbraid Elf, making space for other top-end threats like Kalitas, Traitor of Ghet. You’ve heard of Abzan Traverse. But how about Jund? Such a combination hasn’t been attempted much for a couple reasons, chief among them that prime delirium enablers like Mishra’s Bauble tend to play poorly with Bloodbraid Elf. Fortunately for WILLIAM_CAVAGLIERI, Architects of Will isn’t a valid cascade hit at all. Only two planeswalkers? 20 lands? No Bolts… and Nameless Inversion instead?! This list violates plenty of Jund tenants, primarily because it isn’t a true Jund list. Traverse the Ulvenwald lets it skimp on lands for better topdecks in the late-game, which it had better with no manlands in sight; as such, the deck makeup receives something of an overhaul. One of the more intriguing developments here is Nameless Inversion, especially since Tarfire is generally just straight-up better at the same thing in red. It even goes to the dome and kills planeswalkers, while Inversion whiffs against plenty of Modern decks—not to mention costs twice as much! Sure, Inversion kills x/3s like Mantis Rider, which are plentiful in this metagame. But in that case, isn’t Lightning Bolt worth inclusion despite not growing Goyf astronomically? I also think the sideboard full of bullets is major overkill. As Traverse Shadow has taught us, it’s often better to just have more copies of a deck’s most awesome creatures than a scattered host of occasionally-useful ones. While the innovation in Jund is eyebrow-raising, it’s not necessarily as ooh–aah-inducing as a pile of brand-new brews. So, in the true spirit of this article series, here are three totally novel decklists from the past two weeks of results. How many Kird Ape analogues are actually legal in Modern? At the April 29th Modern Challenge, ZASTOPARIKUS was determined to find out. The final number ended up being 12, with a set of superior Wild Nacatls thrown in for very good measure. That said, this deck’s most eye-catching feature isn’t its creature suite, but its removal package. 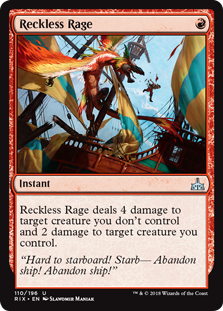 Relative newcomer Reckless Rage makes its Modern debut here, acting as an instant-speed Flame Slash in conjunction with any of the deck’s creatures. With Lightning Bolt Modern’s most-played removal spell, three’s the magic number when it comes to toughness, so many creatures are considered by virtue of that critical extra point—Thought-Knot Seer, Restoration Angel, and Dominaria flavor Shalai, Voice of Plenty, for instance. Flame Slash has always had a damning speed problem, though; it can’t interrupt combos, snap off attacking manlands, or work as a combat trick. Rage fills the void at this price point, only asking a deck such as this one to have a creature in play upon cast. Also of note is the quasi-set of Pyroclasms. I’ve long sworn by Clasm as a sweeper in aggro-control decks, but in the sideboard! ZASTOPARIKUS instead takes a page out of Tron’s book and runs the card main, ensuring his own little dudes don’t find themselves raced by wider or more synergy-driven assaults. OK, “bad” might be a little harsh; after all, this deck performed well at the Modern Challenge. But see if you can figure out what the heck is going on here. Figure it out yet? Help a dude out and explain it to me in the comments. While Swans of Bryn Argoll is no stranger to Modern (if still unrecognizable at the top tables), the card’s often played in conjunction with Treasure Hunt in a balls-to-the-wall, mulligan-into-one-card-and-hope-it-actually-wins-me-the-game combo deck. But we’ve hardly ever seen the card in a fair shell, the closest I can think of being a Skred-wielding deck dubbed “Snow Swans” from 2015. YOZO breaks new ground with this list, which repurposes the creature as an eventual wincon in a Bolting, Remanding Izzet shell. Despite its control affectations, UR Swans is still a combo deck at heart, churning through its library and slinging removal and permission until it can string together a kill. It attacks disruptive opponents from a relatively unique angle, as its namesake combo piece helps the deck stock back up on cards should opponents try to deal with it. The card advantage possible from hitting one’s own Swans with a Lightning Bolt, combined with the pull-ahead graveyard exploitation of Bedlam Reveler, remove the need for Snapcaster Mage in this shell. I imagine UR Swans struggles against faster opponents, especially ones that can beat a few removal spells—the plan of assembling Seismic Assault and Swans on the battlefield at once is far from Modern’s speediest kill. But Swans seems well-positioned to face Thoughtseize decks relative to other combo strategies. I feel like a broken record at this point—for years, I’ve ended these sorts of articles with praise for Modern’s diversity and innovation. But praise for these factors is all I’ve got! When we’ve reached a point where players can opt out of Bloodbraid Elf in Jund, the format’s gotta be dynamic. Did I miss any sweet brews from recent events? Drop me a line below. I disagree that the “sideboard full of bullets is major overkill.” Traverse Shadow is a much faster deck than Jund, so it’s less likely to need answers. He definitely plays a few too many bullets, but overall, in any deck with tutors, having varied answers is way better in the sideboard because the tutor increases the effective number in your deck to 5 for a singleton. I dunno, I found in my experiments with Temur Traverse that the bullets can clog in hand when they aren’t sitting in the deck for us to fish out at will (search MN for more on that). Traverse Shadow’s subsequent success kind of drove the point home for me. I agree that bullets become more relevant in longer games, but I think this particular deck plays a bit too many! I agree that the company list is a bit all over the place, but it wasn’t so long ago that this not entirely dissimilar (if much more focused) GB company list had some success at an open: http://sales.starcitygames.com/deckdatabase/displaydeck.php?DeckID=119447 The grind + land destruction plan seems reasonable. I’m not so sure about tribe elder in this deck as I feel you want more mana sinks (read: more Tireless Trackers) for it to be worthwhile. I suppose it’s a bit like a colour shifted GW company with the angle of recurring edict effects. I’ll say that the deck seems quite good against Bogles! But I feel that with 4 Sakura-Tribe Elder, we might be missing something… just hard to tell why the little guy’s so important. It flips Liliana, but then what? STE also ramps you towards flipping Nissa, and can make clues with Tracker (though that’s really marginal). This looks like a deck that is trying to be BG Pod and is compromising on all the pieces. I don’t get how this is better than Abzan. A lot can 5-0 in Modern, we very well may be reading into this list! Tribe Elder is definitely feeding Nissa but I don’t really think Nissa is a good enough payoff. I think Liliana is much more promising, hence I favour that open list. The BG List ist bursting of Synergy – being able to cast company into a planeswalker is really sweet – and all creatures he plays are there to ensure a fast flip of those flip-walkers: Banewhip Punisher, Fulminator Mage, Merciless Executioner, Thrashing Brontodon and Sakura-Tribe Elder can enable Liliana, with Sakura-Tribe Elder also preparing Nissa and synergizing with Tireless Tracker, too. The Deck seems to be build to have a very synergistic value game – which the the more popular Vizier Company lacks due to the focus on the combo. The Big question is to what endgame – the Vizier Variant has the ability to race other combo decks – this doesn’t seem to have any sort of solid disruption and neither do i recognize any sort of fast clock. It may outshine a lot of decks at grinding – but it looks dead to spell/non-creature based combo. I don’t think this is “better” than abzan on all areas – rather than “better” at grinding and worse being fast.